Let's Do It for ME! : Let's Fund a UK Rituximab Study for M.E! Following swiftly on from the hugely successful and productive 8th Invest in ME (IIMEC8) conference events - during which Dr. Ian Gibson announced that Let's do it for ME campaign has achieved its initial fundraising target of £100k enabling the the IIME translational biomedical research strategy to get underway - IIME announced news today of the next project on the IIME research agenda - a UK clinical treatment trial of Rituximab! Can't wait to donate? Click here for donation options. 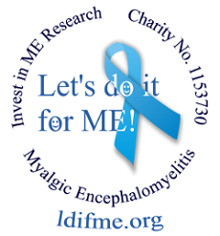 The fundraising for the Invest in ME Biomedical Research Fund Rituximab Project will be carried out by Invest in ME and its supporters in Let's Do It for ME as well as ot hers. Currently details are few as we structure this project and begin the work to make it happen. All funds for the Rituximab project will be isolated from the rest of the Biomedical Research Fund. More details will be added here - or in a follow-on page, when we have those details. This will depend on many factors. As the project evolves we will be able to describe it here. Invest in ME:Invest in ME is formed from volunteers. There are no salaries and no funds will be used for administration costs. All funds raised will be used in full for financing the UK Rituximab project. You can find the following statement on Invest in ME website (click here). It has become clear from our conferences and research meetings that international biomedical research collaboration was necessary to make rapid progress with ME research. Today (6th June 2013) the Norwegian Forskningsradet has agreed to fund the next phase of trials of Professor Olav Mella and Dr Oystein Fluge from Haukeland University Hospital in Bergen . These trials have already been discussed in the last three Invest in ME International ME Conferences, as well as research meetings organised by Invest in ME in collaboration with Alison Hunter Memorial Foundation of Australia. Clinical trials by other groups are important and will provide the continuity and progress we look for. IIMEC7 highlighted the case for clinical trials . Invest in ME and its supporters have decided that a UK Rituximab trial is important in this mix and we have been making initial discussions with researchers, across countries, to facilitate this. We have now decided to embark on a fund-raising exercise to raise funds specifically for a UK Rituximab trial. We believe we have possibility to do this following our BMRMEC meeting  and IIMEC8 conference . There is an opportunity to perform this and we now need help to raise funds.We have proposed this with our supporters at Let's Do It for ME and believe it can be achieved. We have therefore decided to create a separate strand to our Biomedical Research Fund which will be explicitly used for this UK rituximab trial. We aim to build up a fund to accomplish this ourselves but we are happy to accept support from others who have the same objectives as Invest in ME. A specific fund-raising thermometer will be created just for this project. More details of the project will be unveiled as we progress. We invite people to support this great venture and we have already contributed funds for this and have fundraising projects coming online which will add to this. In addition, IiME will be using the Biomedical Research Fund (BRF) to initiate other projects. More details of these will be available as we continue the planning. IiME are also discussing with our EMEA (European ME Alliance) colleagues on ways to increase biomedical research into ME and have recently completed an interesting meeting which discussed this topic, amongst other lines of research. We are confident these projects can be performed and started relatively quickly. If you feel you can support us in any way - by fundraising, by spreading word of this, by simply letting us know that you agree with us then we welcome that support. ME patients and their carers, when determined, are amongst the most resourceful around. The Let's Do It for ME campaign has energised ME research. You can do it - We can do it.